Print these puzzles out on cardstock and laminate for heavy use. Cut the puzzles into strips. Students will complete the puzzles by placing the pieces in numerical order. Print this activity out on cardstock and laminate for heavy use. Younger children will use one-to-one correspondence to count the sprinkles, touching each one with their finger as they say its number name. Older children may practice their set recognition skills to identify the correct amount. 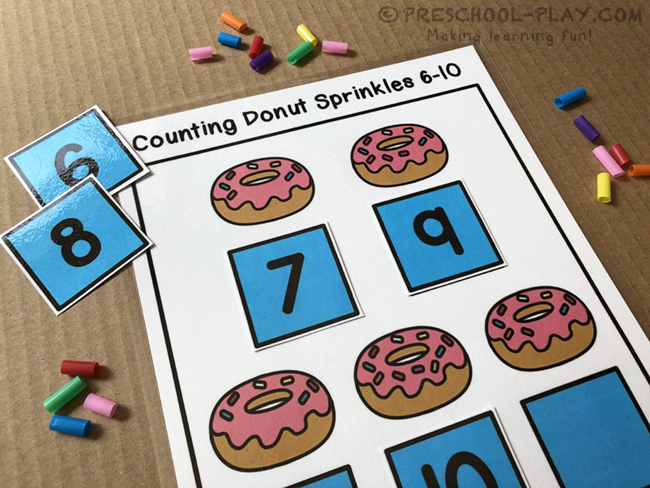 Students will then demonstrate number recognition by placing the correct number cards under the donuts. Print this activity out on cardstock and laminate for heavy use. 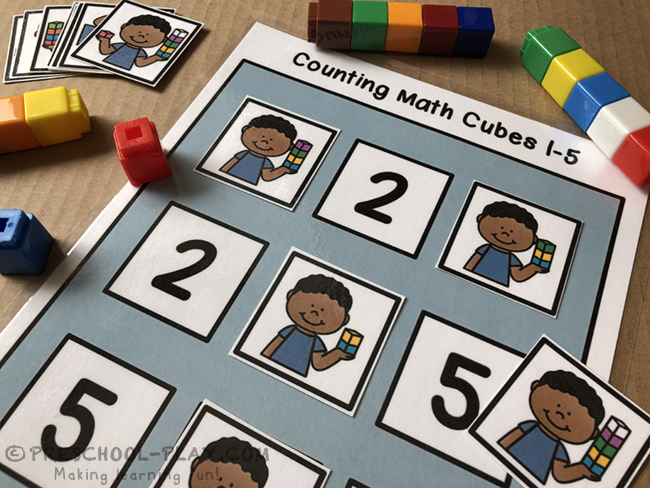 Younger children will use one-to-one correspondence to count the cubes, touching each one with their finger as they say its number name. Older children may practice their set recognition skills to identify the correct amount. Students will then demonstrate number recognition by placing the cube cards on their corresponding numbers. Print these task cards out on cardstock and laminate for heavy use. Provide students with mini apple erasers, red pom poms or red counting chips. 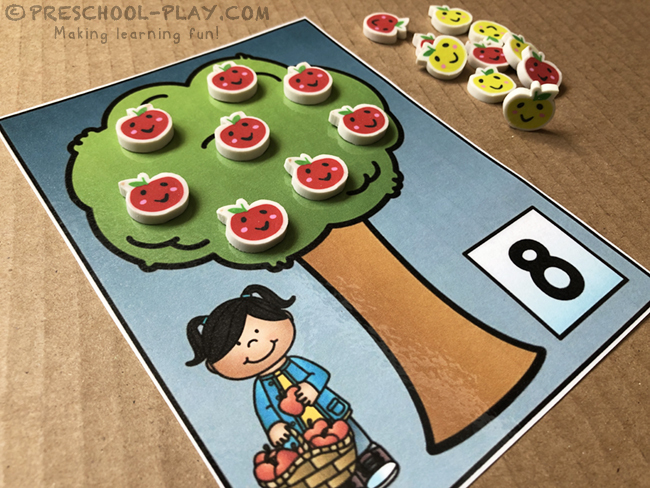 Learners will place a numbered group of apples on its corresponding tree. 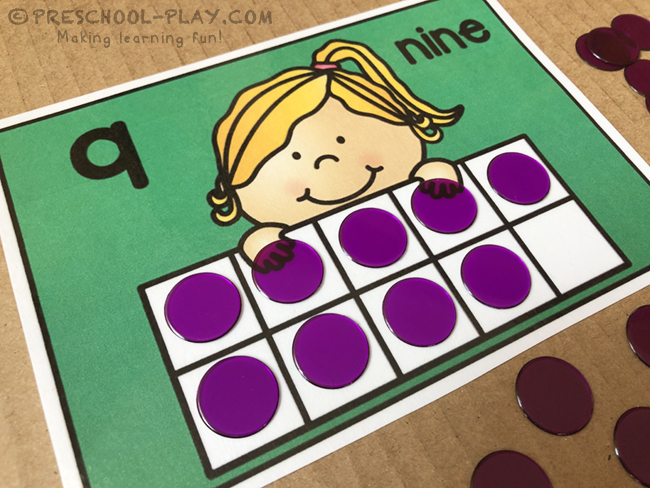 Encourage younger children to use one-to-one correspondence while counting. 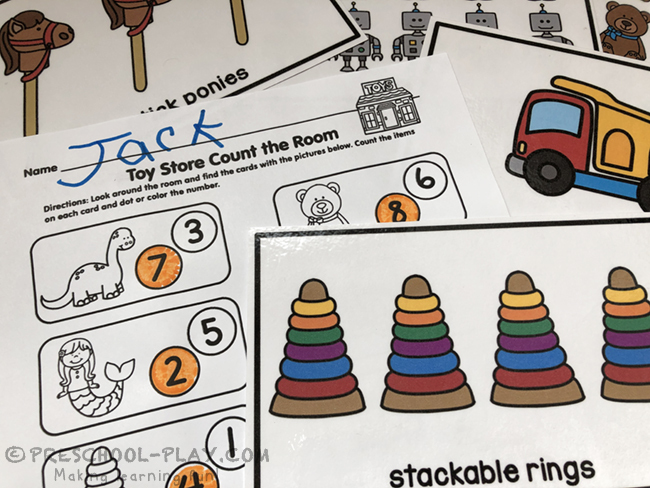 Older children can use this activity to practice set recognition. Print this activity out on cardstock and laminate for heavy use. 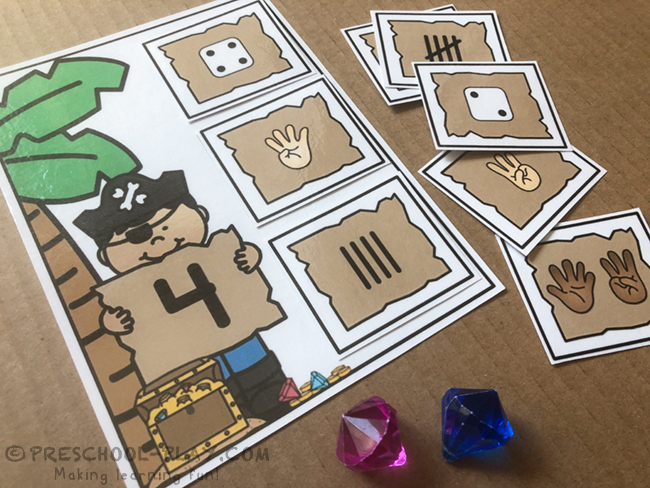 Students will identify the number on each pirate card and place the corresponding sets of items onto their appropriate spaces. 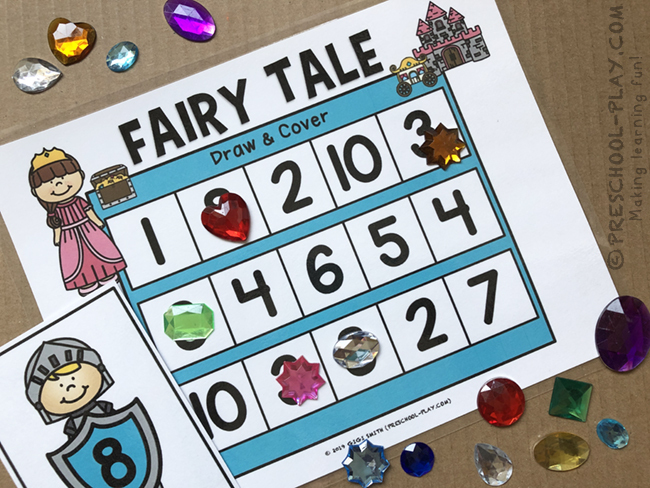 Encourage younger children to use one-to-one correspondence while counting the items. Older children will demonstrate their set recognition skills. Print these cards out on cardstock and laminate for heavy use. 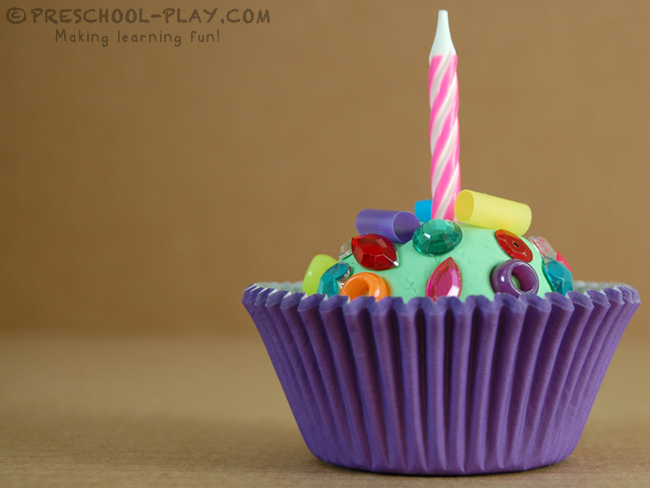 Supply students with playdough, buttons, pom poms, acrylic jewels and/or sequins, birthday candles, and small straw pieces. 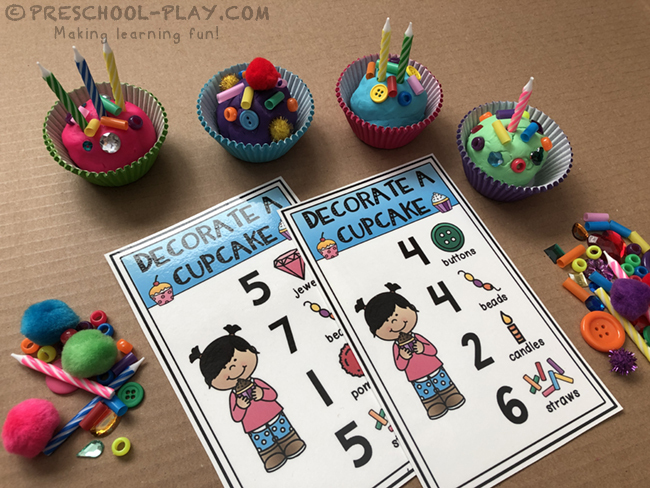 Students will choose a card and follow the “recipe” to decorate their cupcakes. Print these task cards out on cardstock and laminate for heavy use. Provide children with clothespins or a small manipulative to use as markers. 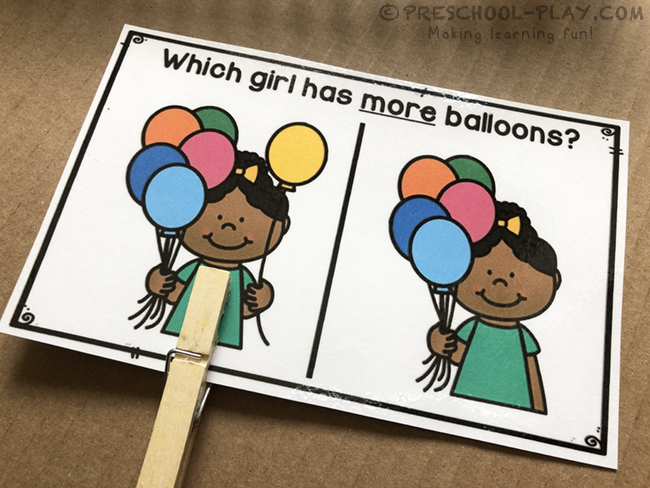 Learners will display one-to-one correspondence and/or set recognition to identify the number of balloons in each picture. Students will then determine which girl has more or less, and clip or mark the card accordingly. Print these task cards out on cardstock and laminate for heavy use. Provide children with clothespins or a small manipulative to use as markers. 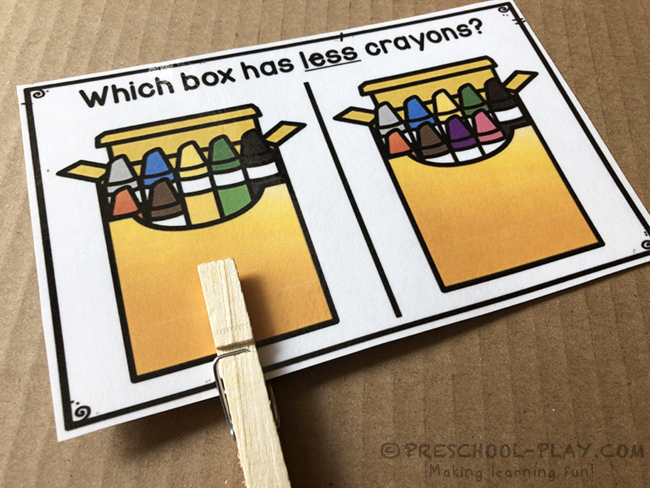 Learners will display one-to-one correspondence and/or set recognition to identify the number of crayons in each picture. Students will then determine which box has more or less, and clip or mark the card accordingly. Print the toy cards out on cardstock and laminate for heavy use. Three different recording sheets are provided to keep this activity developmentally appropriate. If desired, these may also be laminated or placed in protective sleeves, so that they may be used with dry erase markers and dot markers. Place the 10 cards (tape, clip, prop, etc.) around the room. Working with a small group, give each child a recording sheet and a writing utensil. Clipboards are optional. As students discover each card, they will count its items and record the number on their sheets. Print these cards out on cardstock and laminate for heavy use. 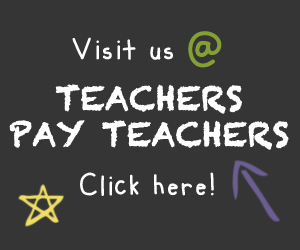 Provide mini erasers, counting chips, pom poms, vase gems, or some other small manipulative for students to use. Young learners will place a numbered group of items on its corresponding card. As children pick up and place each item, encourage them to say its number name (one, two, etc.). Print this activity out on cardstock and laminate for heavy use. Students will display one-to-one correspondence and/or set recognition to identify the number of dots in the frame. They will then place the correct number card on the adjacent box. Print this activity out on cardstock and laminate for heavy use. Cut out the spinner card and attach a paperclip spinner with a round head fastener (brad). Cut out the number cards. 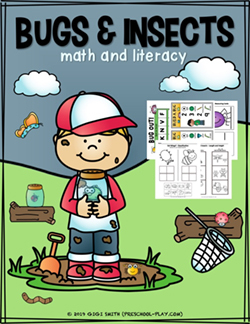 Provide each child with a game sheet and a stack of number cards. Students will be adding numbers 1-5, so the stack should include 2 sets of 1-5 and then 6,7,8, 9 & 10, equaling 14 cards. Learners will compose a number sentence by spinning the spinner. The matching number card of the 1st spin, will be placed on the 1st gray space on the 1st line. The matching number card of the 2nd spin will be placed on the 2nd gray space on the same line. Children will add the 2 numbers together, placing the total number card on the last spot to solve the problem. On the second line, students will replicate the equation using a small manipulative (build sets to match the numbers). 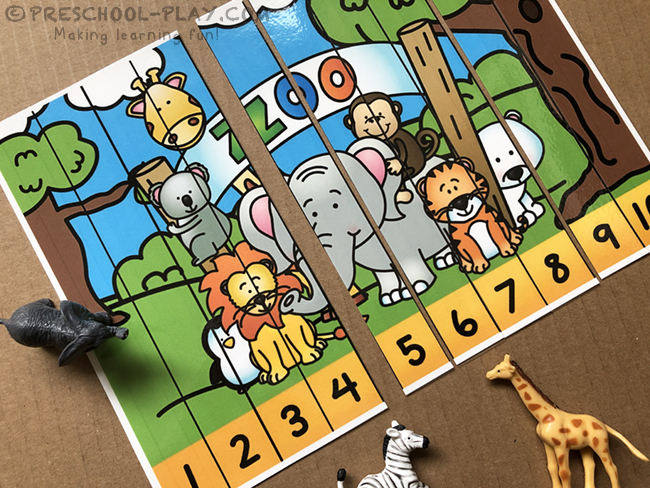 Alternatively, the number sentence can be copied/written with a dry erase marker if laminated or placed in a sheet protector. Print the game sheets and draw cards out on cardstock and laminate for heavy use. Provide acrylic jewels, vase gems, mini erasers or some other small manipulative for students to use as markers. Dot markers may be used for the black and white sheets. 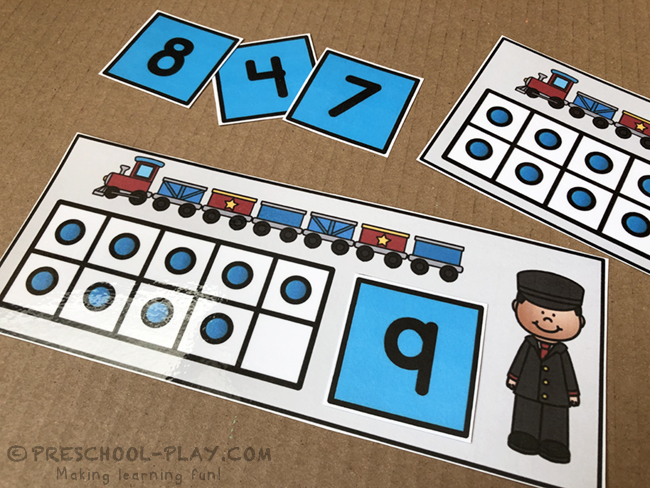 Young learners will identify the numbers on the draw cards, and cover them on their sheets. They will continue until their sheets are completely covered. When using this activity in small group, the first player to cover his/her sheet wins. Trade cards and play again! 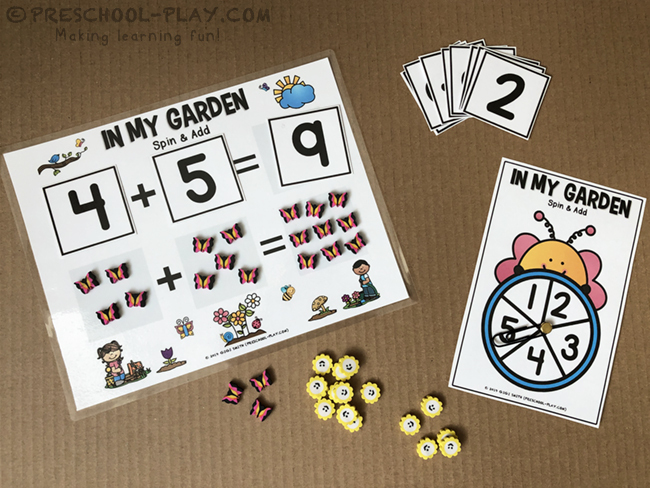 GET THIS NUMBER SENSE 1-10 MATH CENTERS ACTIVITIES PACK HERE.